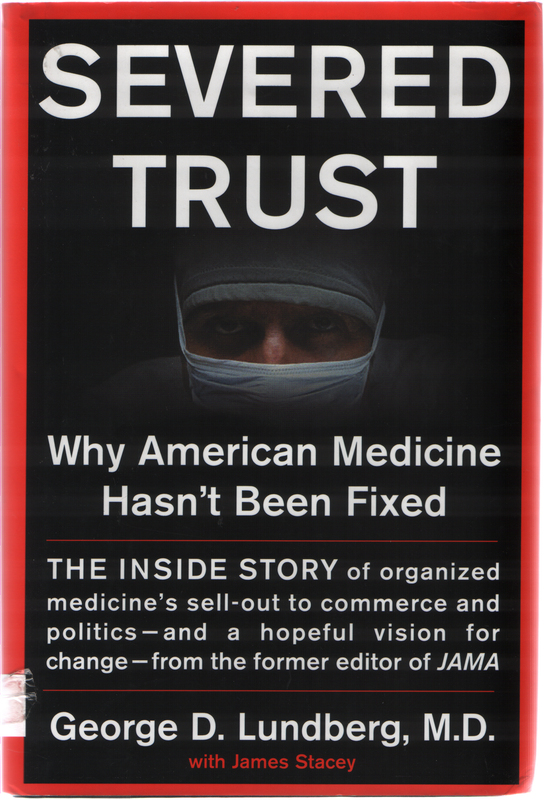 The author was 17 years the editor of the respected Journal of the American Medical Association (JAMA). In January 1999, Dr. Lundberg was sacked by the JAMA leaders. He is now editor-in-chief of the international health information company called MedScape. The following are quotations (in italics) from his book. In the early 1950s, medicine was a caring profession.Medical technology was relatively primitive and inexpensive. Cure were elusive – care services were essentially directed toward compassionate care for the people in need. Today, medical technology has become enormously complex and expensive – it largely neglects giving attention, comfort and reassurance to patients. Americans spent billions for cures and peanuts for care! Physicians have the means to perform any expensive technical procedures and yet they all too often fail to perform the service that medicine was created for. We doctors do not care for our patients, as we ought to. Where is the cure? Chasing after dreams and illusions? For all our progress CURES REMAIN ELUSIVE for a wide range of chronic disorders and life threatening diseases. At the moment, there is no cure for diabetes, multiple sclerosis, arthritis….Despite decades of intense research the cures are all TOO UNCOMMONLY achieved for the major cancer killers – colon, lung and breast cancers. I would suggest that we are putting too many resources into a heroic, almost irrational chase for impossible cures. We’re too often investing in hopes, dreams and illusions instead of therapies that have been proven effective. Medicine is only about money? When the American Medical Association talks about quality, what it really means is letting doctors do and order whatever they wish and thereby letting them make as much money as they can. When patients talk about quality what they mean is getting whatever they think they need as long as the insurance company pays for it. When members of Congress talk about quality, what they mean is providing billions into research aimed at curing all the ills that make their constituents (and themselves) unhappy. The profession of medicine has been bought out by business and unless physicians take it back, it will develop into a business technology in which faceless patients will be treated by faceless technicians. The doctors, patients, hospitals, drug companies, health insurers, government officials, etc – everyone wanted the best but unhappily everyone’s self-interest led them on to the worst. Medicine – based on science? The second most common (surgical) procedure, HYSTERECTOMY…doctors practising it tend to continue to recommend hysterectomy over less drastic treatments EVEN THOUGH SOLID STUDIES of patients’ outcome HAVE BEEN INCONCLUSIVE. BONE MARROW TRANSPLANTATION became a standard treatment for Stage 4 breast cancer while it is still an experimental procedures more than a decade BEFORE STUDIES SHOWED THAT IT IS NO MORE HELPFUL THAN CHEMOTHERAPY. No matter how great the talent, expertise and daring behind innovative, high-tech interventions, THEY DO NOT CONSTITUTE QUALITY medicine. We need to base medicine on science, not on hopes and dreams of cure and profit. Futile care – what does that mean? One particularly onerous deviation from quality standard is so-called futile care – the practice of subjecting terminally ill patients to painful, costly, debilitating treatments that offer little or no hope of any meaningful recovery. Patients in their nineties who display symptoms of multiple organ system failure do not need to have another operation or to undergo another round of chemotherapy. What they need is more attentive care. The Best of All Medicines! In the end, we have to wonder whether LESS isn’t sometimes MORE in medicine. Sometimes the best medicine may be to advise cautious waiting. Often as Archie Cochrane (a renowned British physician of the early 1970s) so eloquently pointed out – the recuperative powers of the body are indeed more powerful than medications. Sometimes the very best therapy comes not from pills or procedures but from professional attention to a patient’s distress. When I attended medical school in the 1950s, I had ONE LECTURE ON ETHICS, at the end of which the professor said it wasn’t all that complicated. It’s mainly a question of applying the Golden Rule, do unto others as you would have them do unto you. Why Medicine is Under Attack? Why is there a general perception that physicians cover up, close rank and sometimes even bury their mistakes? Unhappily, these perceptions exist because TOO OFTEN THEY ARE TRUE. The sad state of affairs is that the profession of medicine seemed to lose its way… it lost its overriding commitment to care for the poor…and it lost its responsibility to self-govern its ranks … (the American Medical Association) was perceived as solely concerned with protecting physcians’ income and the perception TOO OFTEN WAS THE REALITY. What disturbs me even more today, is that the balance between business and professional values has tipped dangerously toward the business side…if the rocking horse rocks too far toward the business side…all trust and respect will disappear. Doctors will be fancy technicians and patients faceless cases. That would be bad for patient health. Errors in medicine kill more Americans per year than would THREE JUMBO JET AIRCRAFT CRASHES EVERY TWO DAYS at O’Hare Field (Chicago Airport). It is difficult for doctors to change their culture. PHYSICIAN EGO IS ENORMOUS. The God image has been around for ages, largely because physicians have to make God-like decisions and offer God-like services. They don’t like to make mistakes. IT IS EVEN HARD FOR THEM TO ACKNOWLEDGE THAT THEY ARE CAPABLE OF MAKING MISTAKES. Every year 45,000 people apply for the 16,000 slots available in US medical schools. These are young people who typically made straight As in college. By the time the 16,000 reach medical school, they are accustomed to being the cream of the crop and recognised for doing things right. It is very diffucult for someone like that to admit a mistake, to say: How could I cut off the wrong leg? How could I be so stupid?